When using ident_current, I have a risk of not always getting the correct identity value in case multiple threads execute my SQL. I wanted to use scope_identity() instead. But how do I use it? I cannot simply replace ident_current with scope_identity(). An option is to use an AFTER INSERT trigger. But won't this have the same issue in multi-threaded environment? -- a stored proc or something. -- you could return the SCOPE_IDENTITY() here for use in the update below. -- update the b column to some other value. -- show the row with the updated value. Simple, and doesn't rely on anything fancy. It is still marked as "Active", however, there is a comment from Microsoft -- February of 2015 -- saying that they are closing it but might consider re-opening it in the future. So, I doubt it will get implemented. If there are multiple instances of the NEXT VALUE FOR function specifying the same sequence generator within a single Transact-SQL statement, all those instances return the same value for a given row processed by that Transact-SQL statement. This behavior is consistent with the ANSI standard. Not the answer you're looking for? Browse other questions tagged sql-server identity or ask your own question. How to add an automatically-populated custom sequence number? 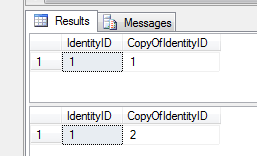 Can an Oracle IDENTITY column be nullable?